At Eastern Mennonite University (EMU), there is always more room for God’s presence. In 1979, a group of students led by Jerry Holsopple, now a professor in the Visual and Communication Arts Department, wanted something more than what the institution’s daily chapel had to offer. They came up with the idea for Celebration, which remains a part of EMU today. 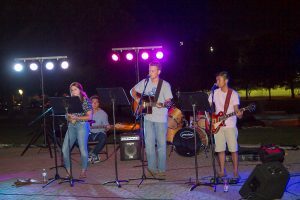 Celebration draws students on Sunday evenings at 9 p.m. to Martin Chapel for an hour of student-led worship. Student leaders recently hosted an evening gathering early in the fall semester at Thomas Plaza to introduce Celebration to new students and encourage returning students to attend. Celebration was supported entirely by students at the beginning, Holsopple says. Meetings in the Discipleship Center on the hill were advertised only by word-of-mouth. Because a campus minister did not offer help, Celebration was not officially supported by EMU, Holsopple recalled. No faculty or staff were involved. Students came to Celebration to join in a more informal style of worship than what they had grown up with at church or in the home, Holsopple said. Celebration served as a place for students to use their own gifts and to develop an understanding of what it meant to be leaders in a faith community. At first, the only instruments were Holsopple’s 12-string guitar, which he said was very loud, and another guitar played by a student named Kim. The students had to project their voices as there were no sound systems and microphones. This search for “authentic worship” went beyond the festivities at Celebration. Holsopple says not all students liked the idea of required chapels. A few students, including him, received permission to put together Bible studies that fulfilled the chapel requirements. Holsopple remembers leading a study of the book of Hebrews that forced him to dig deeper into his own spirituality. “The creation of Celebration was an extension of that desire for more,” he says. 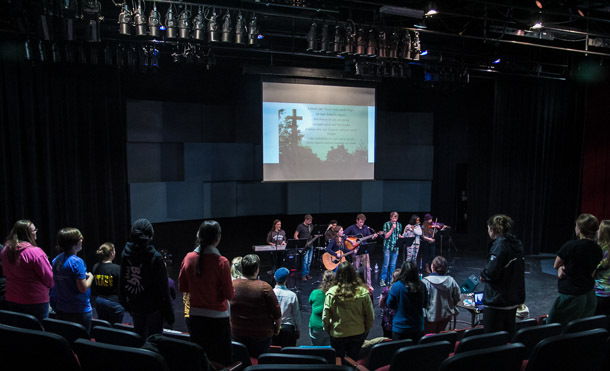 Though Celebration is not officially a part of Campus Ministries, it has been a student club since 2007 and is overseen by a campus ministries staffer. Today, students are still seeking God’s presence at Celebration with a little more musical variation. Junior Grayson Mast, the current student leader, says the goal is for broad appeal. Last semester, the leaders included hymns in their song rotations and invited the Gospel Choir to lead Sunday evening worship. 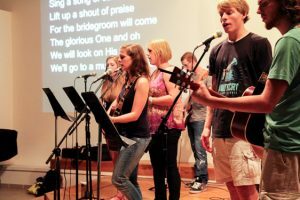 “These different musical styles offer a place for students from different spiritual backgrounds to come and worship our God together,” Mast says. Since the beginning, Celebration has been about worship more so than a message. Mast says they do not typically have speakers, but those present will get into small groups for a time of prayer. Junior Hannah Shultz, a regular attendee, says the event is special because it provides a place to worship with others who love God. Shultz also worships with dance, and Martin Chapel provides enough space to do so, unlike other churches. Shultz talks about moments that stand out to her during her Celebration attendance. In one instance, “We sang ‘Guide My Feet’ while walking around the room,” she says. Several times, a woman from the community prayed at the back of the room while the students were singing. Nice to know that you guys use celebration service to connect in the Lord. Its always fun to participate in such a school activity.